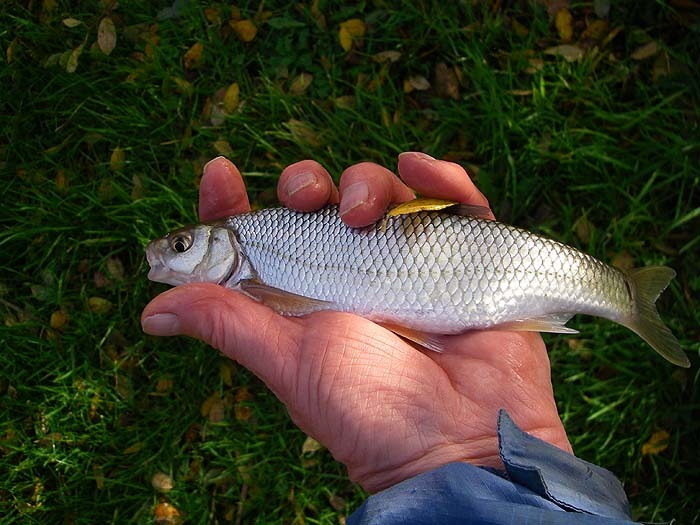 I don't really like the term 'coarse fishing' because it's nothing of the kind (actually it is the way I do it but most coarse anglers use only the finest tackle). Anyway, the weather has not relented. After my recent abortive sea fishing trip I felt that I needed to catch something. 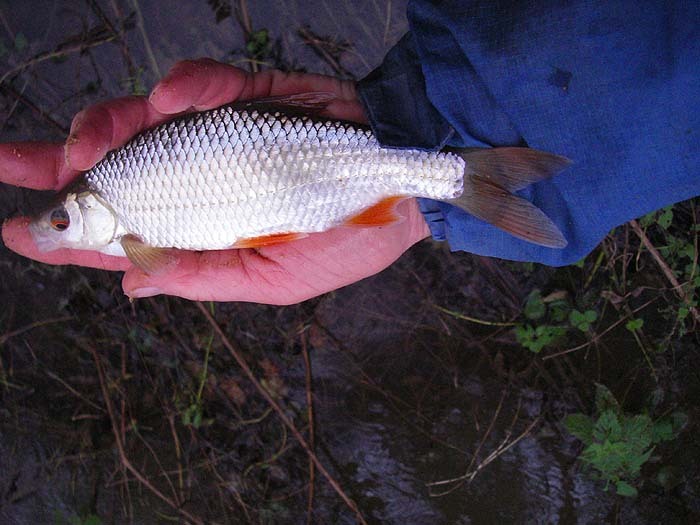 The problem was that it had rained heavily and repeatedly so the river was high and filthy. Undaunted I decided to give it a go. 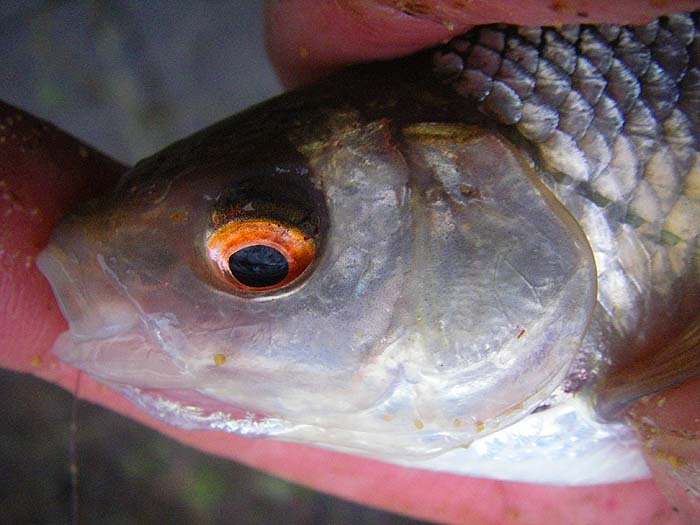 I'd managed to collect a few lobworms the night before so my first attempt was to catch a grayling on a legered worm. Not a sniff! I moved to a side stream which to be honest didn't look any better than the main river. I changed the hook for a smaller one and swapped the worms for maggots before wandering along searching for a bit of a slack. I came to a small pool with the water roaring through it from an open hatch. Unfishable! On one side of the pool was the mouth of a ditch and perhaps a couple of metres of smooth, steady (if rather murky) flowing water. I clambered down and standing knee deep with my maggot box floating beside me among the flooded nettles I began to fish. I was still touch legering with a couple of AA shot for weight. I simply lowered the bait into the steady flow and jiggled it up and down on the bottom. After about five minutes I felt a knock and my strike met with a bit of resistance - nice dace! I kept loose feeding a few maggots and next cast another dace, then another and another. Some of them were quite big fish. 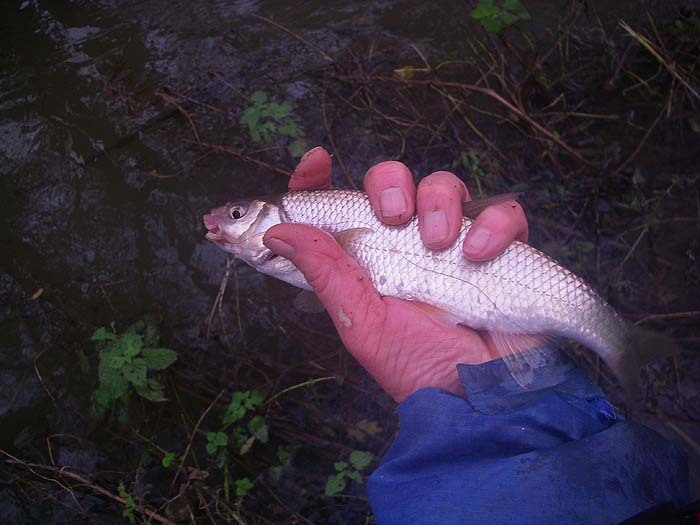 Then I had a roach, another dace, a second roach and so on until I eventually packed in. Of course none of my fish made the clutch scream or even put much of a bend in the little spinning rod that I was using (a really handy little weapon under the hanging branches incidentally) but they were fish and I enjoyed the session.